Last month, the girls and I stumble upon a wonderful deal on Groupon. We have been meaning to do our nails together. Not sure if you all have ever done your nails with your besties but I would totally recommend nail pamper sesh with your bffs <3 So back to the Groupon deal, we found Honeycoat Nail parlour that does Gelcolour manicure + express pedicure for RM38! Talk about a steal! FYI I checked with the store and they said that all first time customers would get a chance to enjoy this amazing deal. 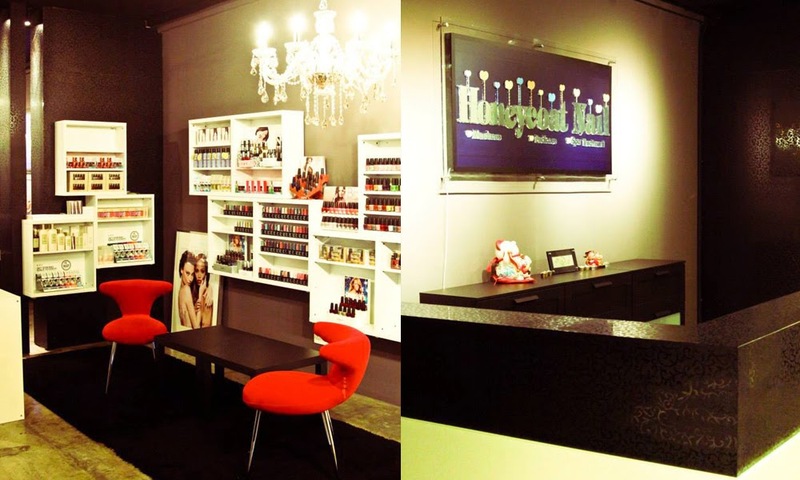 Honeycoat Nail Parlour is located near 7-Eleven within One City Mall. At first look of the place it has a very posh Victorian style. Super love their couches and nail station as it was very comfortable. They also have a TV there to help ease the duration of getting your nails done. Not sure if you all remember my previous nail post of BeeQnails. Well if you do remember, you would know how big of an OPI and Gel Nail Polish fan I am. Super love the colour intensity and the long lasting effect of OPI. Guess what? Honeycoat Nail only uses OPI products in their store! I just realise that I always stick to my same collection of OPI Colour. Super love the DS Collection. Something about the sparkles just screams "look at me". I think I went with DS Radiance or some other silver sparkle colour. Since I did it before Christmas, I also wanted to make sure that my colour could match for New Year. Pretty right? I received a LOT of compliments for nails during the holidays :D But sadly it's time to remove it. MAKE SURE THAT YOU REMOVE YOUR GEL Nail Polish after a month! If it's longer than a month, your nails would be in a good condition. Shall now spam some pictures of the girls and I during our nail session. If you are wondering why my hair looks different, it's because I had it in a party updo by Hairco. Remember that blogpost before Christmas? haha. Anyways all of us have our own style and can you guess which hand belongs to who? I love how fast and professional Honeycoat Nail was with us. I can't wait to go back there again for some pampering time. For RM 38 to get Gelcolour manicure + express pedicure is really a STEAL and I would really recommend anyone who is thinking of getting their nails done.